This cable is used to connect the VIDEO port of your Commodore to the video inputs of your modern TV's S-Video Inputs (4pin mini-DIN labelled S-VIDEO). This is the highest quality cable we have for the Commodore with shielding of the video sections for high EMI noise rejection. See photos for connection examples. This cable has a resistor to correct the Chroma video signal level and a shunt to reduce electrical noise on the Audio Input line. 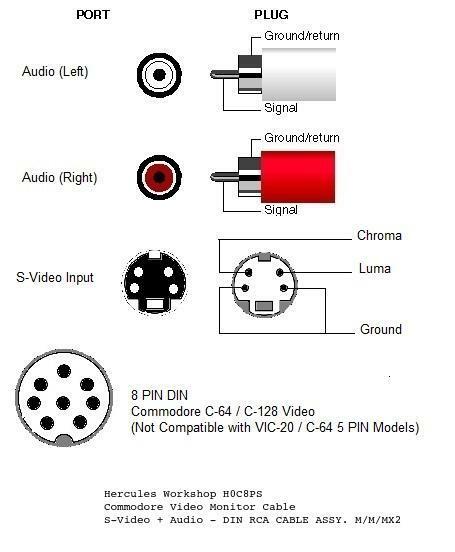 Only the 8pin VIDEO model Commodores output the signals required for S-Video. This cable is not compatible with the 5pin VIDEO models (VIC-20 and early C-64's). Shipping Costs listed are for Canada and the USA only. For International orders please contact us prior to checkout for a shipping quote shipping@herculesworkshop.com. We offer two shipping options for this product, both are Air Mail and both are insured but ONLY the Tracked Packet comes with a Tracking Number. Hercules Workshop is committed to excellent service. Orders are processed immediately, with most shipments made within 48 hours. In most cases your items will arrive within 4 to 6 business days of your order being received. If you are not satisfied with an item, we will promptly exchange the product or refund the purchase price. Hercules Workshop has a 90-calendar day return policy.